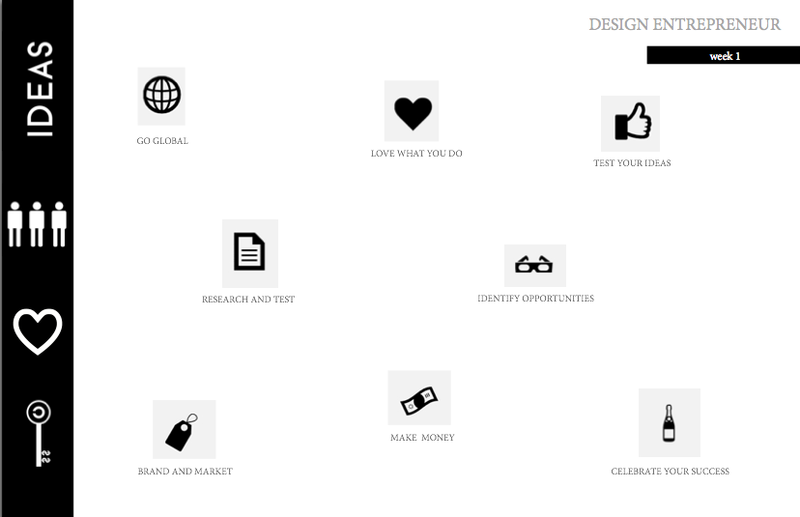 WHAT IS A DESIGN ENTREPRENEUR? A DESIGNER WHO CONCEIVES MARKET-DRIVEN CONCEPTS AS AN ANSWER TO THEIR OWN ENTREPRENEURIAL NEED. THESE DESIGNERS CAN DO THIS ON A PART-TIME BASIS OR SEEK OUT A FULL-TIME ROLE AS AN ENTREPRENEUR. IF ALL GOES WELL, PART-TIME TURNS INTO FULL-TIME AND PASSION BECOMES PROFESSION. BUT EITHER WAY, SELLING ONE PRINT DOESN’T MAKE YOU AN ENTREPRENEUR. THESE DESIGNERS ARE DEDICATED TO TRANSFORMING THEIR IDEA INTO A PRODUCT. A PRODUCT THAT WAS SELF-INITIATED TO FILL AN IDENTIFIED MARKET NEED. DESIGN THINKING IS A PROCESS FOR PRACTICAL, CRE- ATIVE RESOLUTION OF PROBLEMS OR ISSUES THAT LOOKS FOR AN IMPROVED FUTURE RESULT. All things start and evolve around your vision. Your big idea. Brainstorming, mind mapping, and sketching help designers arrive at their best concepts. By being open ended and then nar- rowing in, you will amplify the best features of your concept. By this, I mean constructing a proposal made of research, sketches, mock-ups, and concept development work. It’s a final definition for what you’re creating. You’re prepping to test this thing out, then pitch it. Our fluency in graphic design helps us solve, engage, communicate, and create visual appeal. As designer’s, we have our own personal styles that distinguish us from one and another. So highlight this, but understand that the public is now judge and jury. I’m not going to tell you how to design. That’s your job. Taking your ideas public to see if anyone is interested in this product and would consider purchasing it. You want to give more in use value then you take in monetary value. characteristics of your company into a strategy and visual language. We all judge a book by it’s cover so make that experience compelling and informative to help you customers make a positive buying decision. If you delight them, they will pass it on to their friends. And your product will go viral. Your price is based on manufacturing costs, overhead, professional services, marketing costs, and distribution costs. Once you have researched and gathered this information, you can determine the price. Pricing will vary, depending on many variables but generally a margin of 20% is considered very attractive. That is you make a profit of 20% of the sales price of the product. 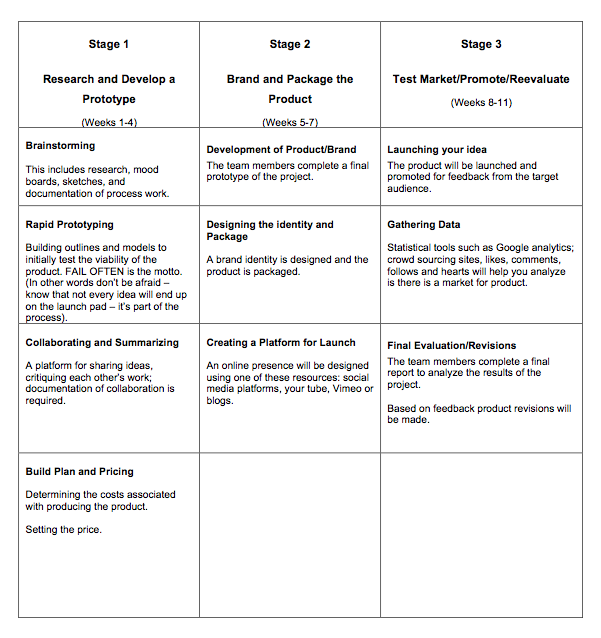 At this stage you have created your marketing plan and determined how you will distribute your product. Generally launches are celebratory and the more buzz that you can create around your product the better. Using social media is a great way and an inexpensive way to spread the word. Using various online tools such as Google Analytics, blogs, Twitter, Craigslist and of course Facebook you can determine if people prefer your product. This is an ongoing process and indeed many entrepreneurs start businesses that don’t make it. Sometimes its a matter of changing the brand, the brand strategy, the distribution channels or the price. By continuing a dialog with your audience you can determine if there are things that you can do better to be more successful it is an ongoing process.